If your superautomatic espresso machine needs a mini tune-up, try this Saeco Maintenance Kit brimming with extra handy items, parts and cleaning solutions that will help keep your espresso machine in tip top condition. *Note: Fits all Saeco superautomatic espresso machines except the Vienna, the Royal and the Magic. The Intenza water filter does not fit the semi-automatics like the Aroma, Poemia and the Via Venezia. **Note: Previous versions of this kit came with 10 coffee cleaning tablets, but the current kit does not. Great Value - This kit contains all the essentials you'll need to keep your espresso maker running like new, and all at a great price. Easy to Use - You'll find that this tune-up kit is a cinch to use. 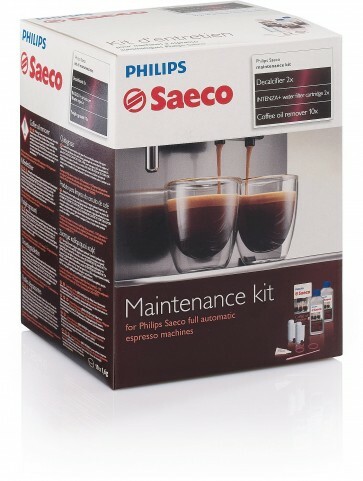 After you watch a few of our maintenance videos you will see how easy it is to do regular maintenance yourself on the Saeco superautomatic espresso machines. Wash the brew unit with running water at least once a week. Lubricate and replace the O-Ring after approximately 500 brewing cycles.